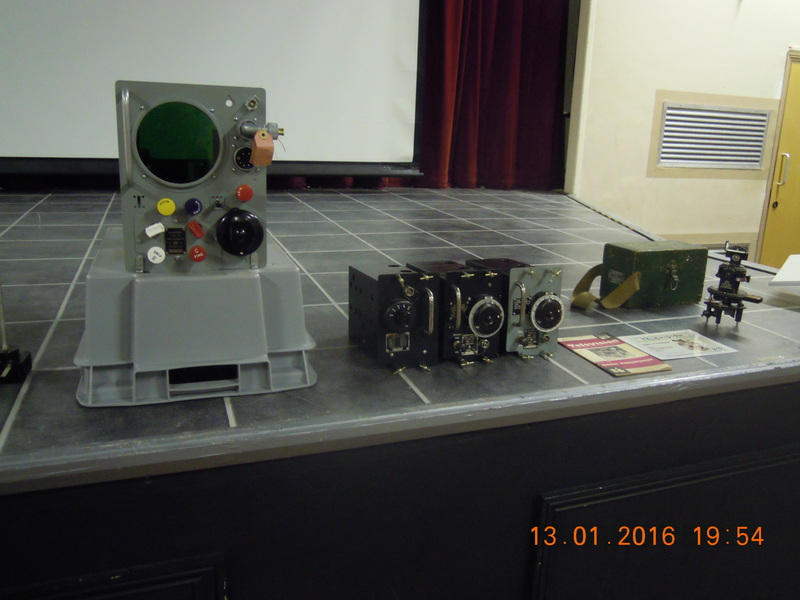 Attendees at MRATHS’ latest meeting arrived to see assorted Gee navigation equipment on stage provided by the Electronics Restoration Trust. Hugh Williams opened the meeting and reported the sad loss of Bob Embleton. 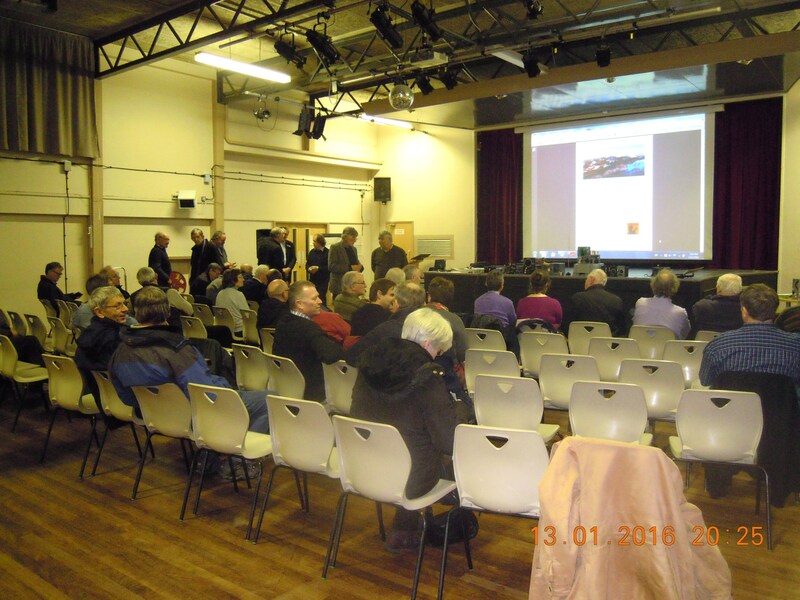 Hugh described the 75yrs anniversary of the Tizard mission to engage the USA in WW2 and displayed our customary mystery pictures that received helpful comments from the audience. 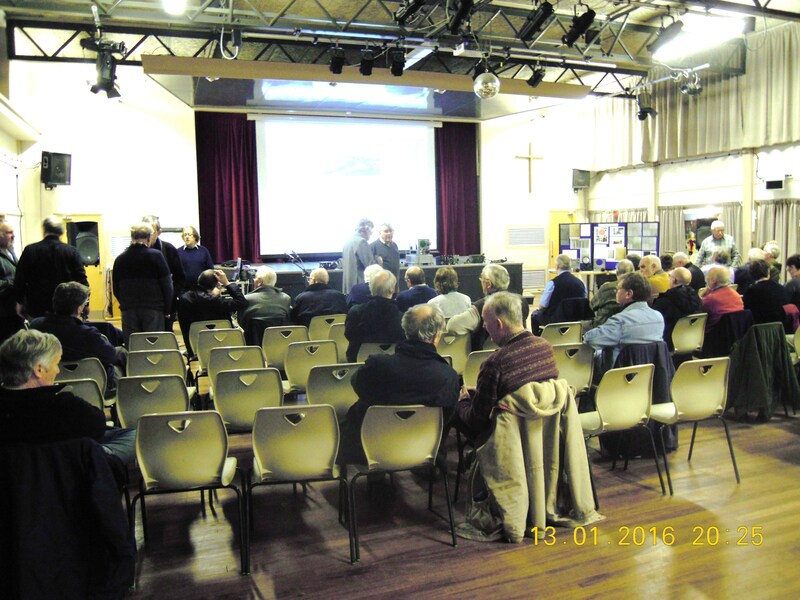 Dr. Mike Diprose, Mr. Richard Hankins, and Mr. Tony Waller provided the main presentations on “Gee – The Radio Signpost in the Sky”. We heard about the British intent to use Bomber Command to take WW2 to the Continent and the need for night bombing. Stories of the hazards and the demoralising fact that 5% got anywhere near target – including one mistaking the Thames estuary for that of the Rhine! The Gee navigation system was explained alongside its development intertwined with the political and intelligence background and including a demonstration of Gee operating. David Baker continued with a description of today’s Galileo system and QinetiQ’s involvement “seeing a light bulb half-way to the moon”. Refreshments accompanied the usual fond reminiscences and discussions that followed whilst discussing the exhibits with the speakers. Following the overrun of Europe by the Nazi armies it was realised by the British Government war leaders that Bomber Command was the only force capable of carrying the war to the Continent. Severe losses in daylight raids early in the war led the R.A.F. to concentrate on night bombing for many years until the situation changed late in 1944 and in 1945. 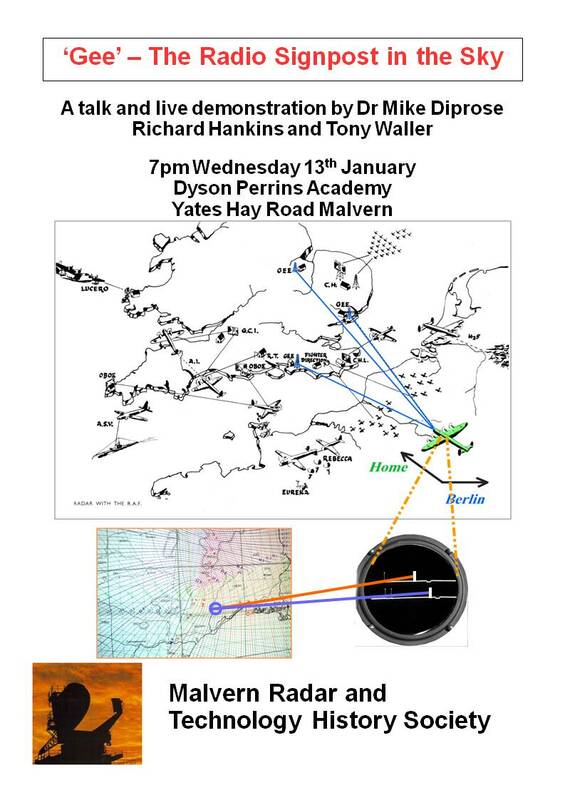 Navigation by night over enemy territory – often in inclement weather – was a hazardous affair and in 1940/1941 typically only 5% of the bombs fell anywhere near the targets. This was de-moralising for the crews and unhelpful to the war effort, as well as being a waste of life and resources. The ‘Gee’ radio navigation system developed by R.J. Dippy and his colleagues, was a passive, pulse based system, which, after its introduction in 1942, revolutionised both the accuracy of bombing and the tactics of Bomber Command. The deployment of ‘Gee’ also ensured the Command continued as an entity, since there was considerable pressure in 1941/early 1942 – especially from the Admiralty – to disband it and disperse it’s aircraft between the Army and Navy. The first part of the lecture (Mike Diprose) will examine the need for ‘Gee’ and its effectiveness when introduced. In addition some of the background politics and inter-departmental rivalries, which affected the introduction of the system will be discussed, as it was, by no means, all a smooth affair. Some of the incidents surrounding its introduction to squadron service will be described as well as the problems caused when one of the prototype sets was lost over Germany and the large scale deceptions practiced to try to prevent the Germans realising what it was for. The second part (Richard Hankins, Tony Waller) will be a brief description of the system, a demonstration of the equipment and the principles of operation explained. Then there will be a description of the project to re-create a Gee Mk1 system, since no-one seems to have seen any of the equipment (apart from one receiver) out of the several hundred built. Mike graduated from the University of Kent at Canterbury, with an Honours degree in Electronics in 1969. After a year in Africa with V.S.O. in Uganda he returned to Canterbury, for a Ph. D. in Medical Electronics which was awarded in 1976. He then moved to the Department of Electronic and Electrical Engineering at the University of Sheffield to research into electrical methods of weed control using high voltages and microwaves. He joined the staff in 1982 and stayed until he took early retirement in 2002. He still pursues his research activities into electrical weed control and has his own company – Spectrum-tec Ltd which is currently working to bring electrical weed control equipment to market in the UK and Europe. He was Chief Lecturer for the 1996/97 IEE Faraday lecture series ‘But What’s the Use of it Mr. Faraday?’, a member of Council of the IEE and Chairman of the South Yorkshire Branch of the IEE/IET for three and a half years until 2007. 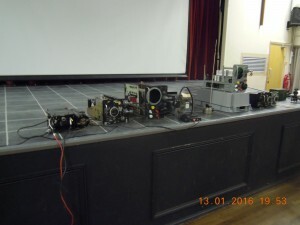 He has presented several lectures for the IET, covering subjects as diverse as the role of the arts in science and the evolution of airborne radar in WW2. 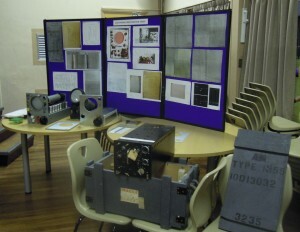 Richard gained an interest in military electronics from serving in the Signals Section of his school CCF. 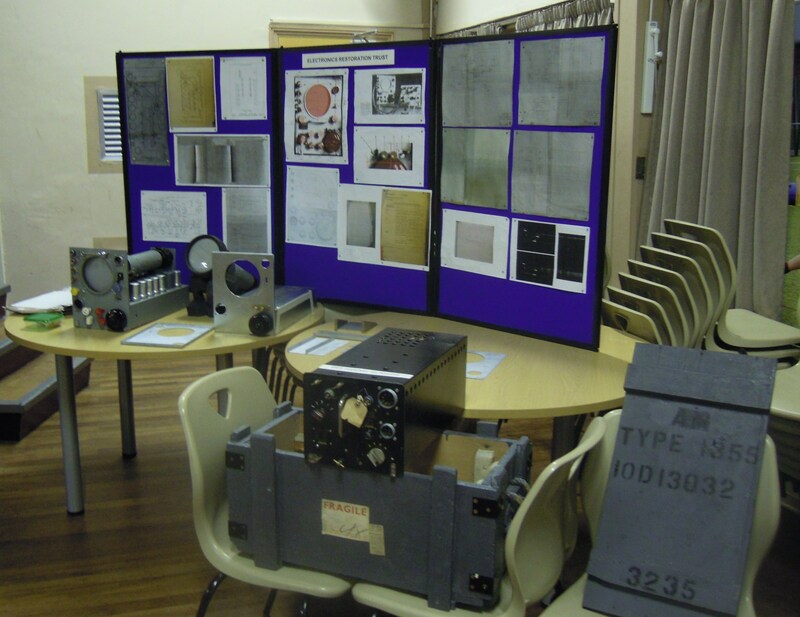 A variety of WWII era radio and line communications equipment was in regular use for CCF exercises, school events and inter-CCF communications via an HF radio network. This approved equipment was supplemented by regular purchases from GWM Radio in Worthing, which provided him with invaluable “hands-on” experience of radio and electronics. This early interest was further developed by taking an Engineering degree at Churchill College, Cambridge 1974-77. He then spent four years at Pye Telecommunications in research and development of frequency synthesisers for mobile radio equipment, which until then had used custom made quartz crystals for every channel in every equipment made. Frequency synthesis principles were well known at the time, but had only been used in military equipment up to that point, and needed considerable development to make them viable for commercial use. Richard’s further career continued at Racal Security (Edinburgh) in the fields of short range (in-building) radio systems and EMC for alarm systems, always being “ahead of the curve” in translating high cost military techniques to the commercial, high volume world. His last job was as a systems engineer for Nortel, working the Ionica “last mile” telephone system, designed to replace copper distribution networks with 3.5GHz radio links. This failed in the UK, but was successful in a number of developing countries including Sri Lanka and Mexico. Richard took early retirement in 2001 due to ill health, but has continued to pursue an interest in vintage electronics. Tony was brought up in the East End of London during the war surplus years and followed his father’s interest in collecting surplus radio gear etc. Tony trained as a teacher, but left teaching to manage a number of manufacturing companies in the electronics field. He took early retirement at age 50 but then accepted the raw material buyer’s position at Scot transformers. 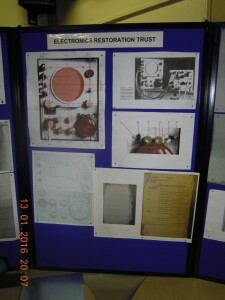 Retired now, he is a founder member of a small group, the Electronics Restoration Trust, (ERT, a Trust in formation), looking to preserve the key technologies developed during the early years of the 2nd World War and focusing on rare or impossible to find items or systems. 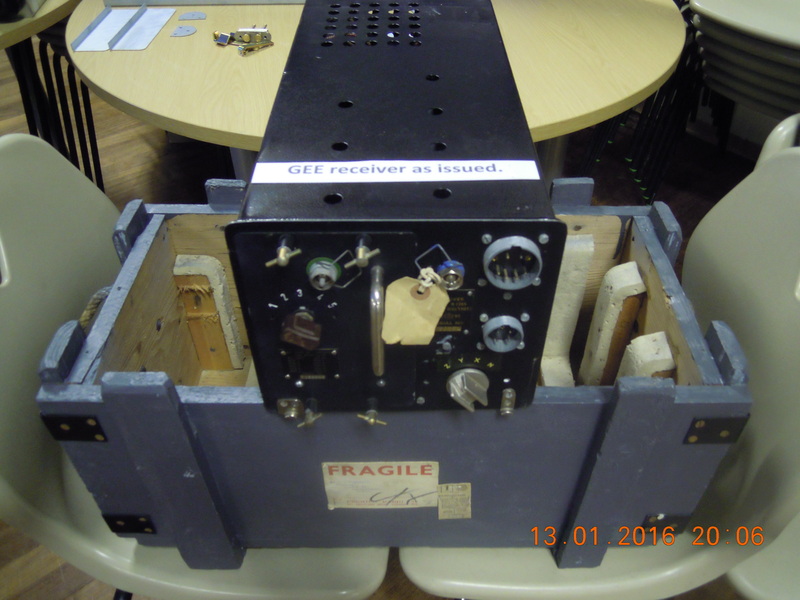 Earlier this year he accepted an award from the Defence Electronics History Society, on behalf of ERT, for their work on the GEE Mk1 navigation system, which was virtually lost to history until the ERT undertook to re-create a full set of components.